The Beretta lifestyle of advanced shotguns, stylish apparel and mouthwatering accessories will soon turn another page in leafy Dutchess County, New York as the Beretta Shooting Grounds at Dover Furnace embarks on an ambitious buildout of new lodging at one of the top clays destinations in the country. Only a 90-minute drive north from the luxe Beretta Gallery on New York’s Upper East Side, the development parlays the ground’s architectural history as a former New York City Mission Society fresh-air camp and previously a regional 19th century smelter into one of the most fashionable shooting resorts in the Northeast. The ruins of the Shaparoon blast furnace on the Beretta Shooting Grounds at Dover Furnace. The Beretta Shooting Grounds at Dover Furnace is a repository of period construction. The acreage around the clays shooting stations is populated with cabins from the New York Mission Society. 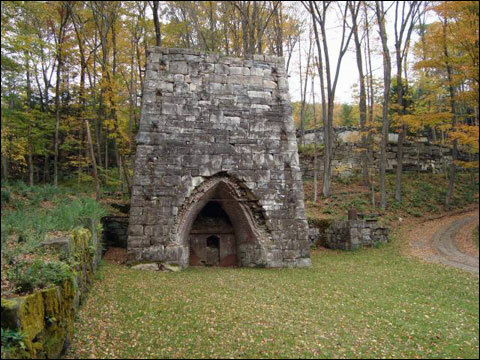 Dating back further are remnants of the circa-1880s Shaparoon blast furnace towering monolith, along with several outbuildings from the smelting operation. The available buildings present an opportunity to expand lodging to some 63 rooms from the current six that are now available, said owner Jim Muncey. He anticipates the extra capacity to attract more corporate and fund-raiser shoots as well as weddings and various social functions. Bonus features will upgrade boating facilities on the five-acre lake prominent in the clays courses with the addition of rifle and pistol ranges as well as shooting instruction. 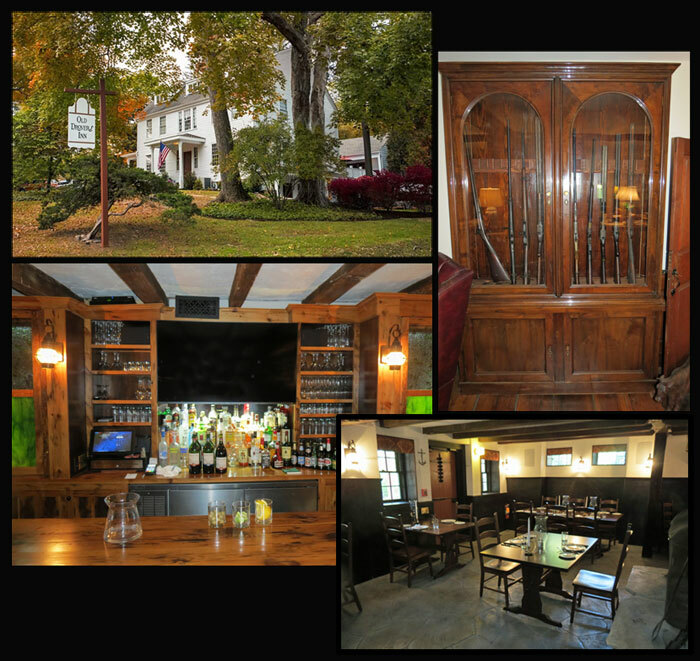 Images of the Old Drover’s Inn that encompass the upscale lodging expansion at the Beretta Shooting Grounds at Dover Furnace. The historic atmosphere of the Berkshire Foothills extends to the sister Old Drover’s Inn. Originally opened as the Clear Water Tavern in 1750, the white, clapboard sanctuary underwent a major restoration in 2013 that preserved the rough-hewn woodwork modernized with up-to-date windows, central air conditioning, electricals, decorator bathrooms and personal comforts expected from a plush bed-and-breakfast adorned with antiques. Mr. Muncey, an entrepreneur and sportsman, is the driving force behind the expansion. He owns a local construction company and high-tech security firm. He purchased the 2,000 acres of Dover Furnace in 2008. By 2012 his vision of a world-class clays venue became an industry institution through Beretta’s imprimatur. 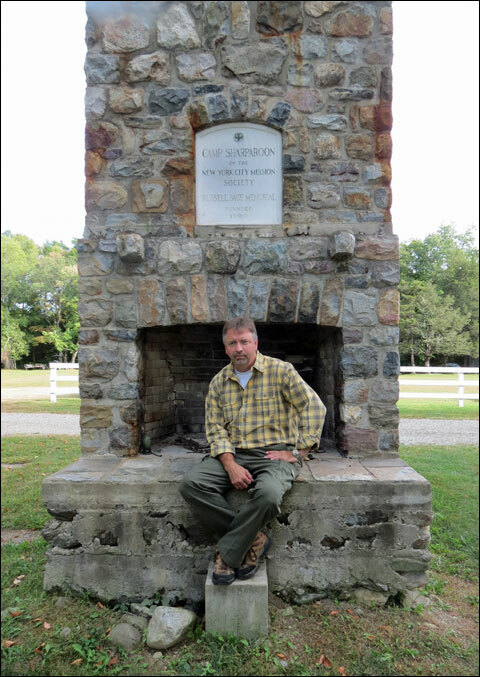 Jim Muncey takes an uncharacteristic break at one of the historic monuments at the Beretta Shooting Grounds at Dover Furnace. Mr. Muncey is a human dynamo. 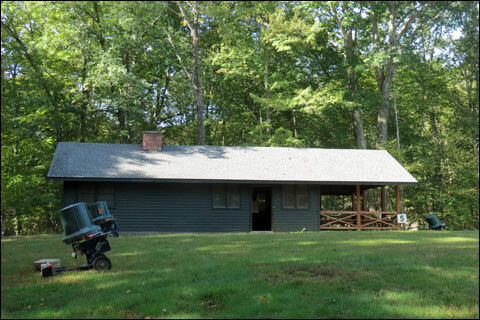 In conjunction with the original construction of Dover Furnace he opened the nearby Ten Mile River Preserve – a private membership club for outdoor enthusiasts that also offers lodging. Wing and clays shooting, bird-dog training and boarding, along with hunting and fishing, take place on 3,000 acres of fields and hardwood ridges that also feature 200 acres of lakes and the Ten Mile River. One of the cabins from the New York Mission Society slated to be converted to luxury lodging on the grounds of the Beretta Shooting Grounds at Dover Furnace. Given that all his properties are within minutes of each other, Mr. Muncey operates a self-styled campus for local shotgun enthusiasts that also draws the affluent set of Greater New York City. The parking lot of the Beretta Shooting Grounds at Dover Furnace, for example, holds a mix of sweaty pick-up trucks, econo-beaters and high-performance exotics that howl through their power band on the snaky foothill cut of the nearby Taconic Parkway. 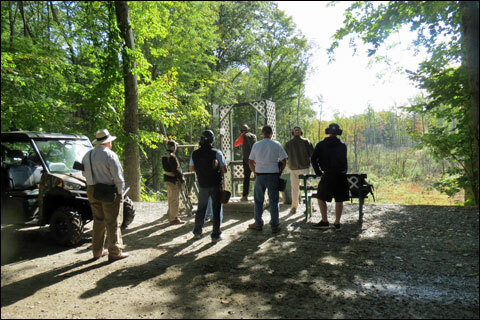 The upscale potential of the future lodging program was certainly underscored by the vendors participating in the 2015 New York State Sporting Clays Championship held at the Beretta Shooting Grounds at Dover Furnace September 24th – 26th. The white tents hosted luxury brands such as Griffin & Howe, Holland & Holland, Steve Barnett Fine Guns, Charles Boswell, Perugini Visini, Russel Moccasin, Ermilio Clothiers, Robin Hollow Outfitters and BraeVal. 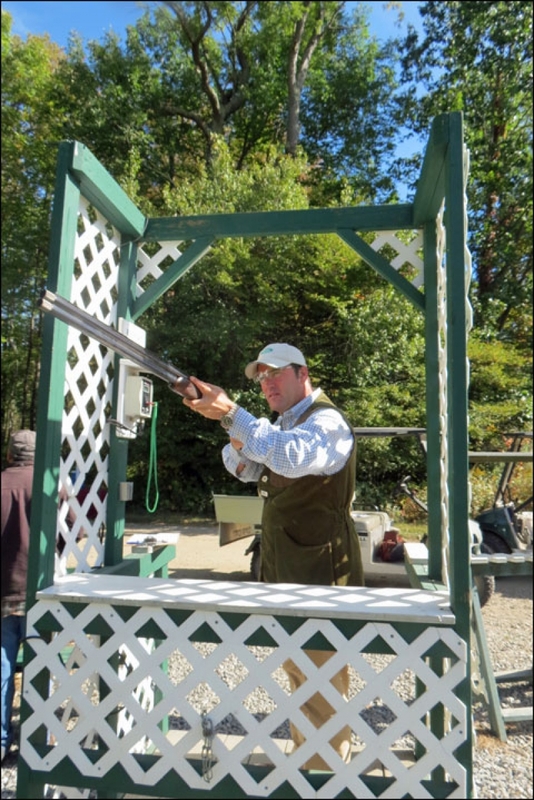 Guy Davies, Executive Sales Director at Holland & Holland’s New York City showroom, competed in the 2015 New York State Sporting Clays Championship. The championship bundled seven competitions that included sporting clays, FITASC and 5-stand. Categories were allotted for hammer and hammerless, pump guns, side-by-sides and sub-gauge. Shotguns echoed through the surrounding forest beneath bluebird skies with whiffs of autumn. During the event, initial signs of expanded lodging were immediately evident with the new Beretta Pro Shop. The business had moved from an older bungalow to a new cabin about 70 yards away, which is three times bigger. The homey front porch displayed Beretta clothing while inside the gun room held an impressive inventory of Beretta shotguns. The available slots in the gun racks will be filled with used and consignment long guns that inaugurate a fresh sales push in firearms. Meanwhile, the original pro shop is slated for conversion into cozy guest quarters. The new Pro Shop at the Beretta Shooting Grounds at Dover Furnace. “We’re definitely going more upscale,” Mr. Muncey said. His younger brother Jeff manages the Old Drover’s Inn and caters meals to The Beretta Shooting Grounds at Dover Furnace and Ten Mile River Preserve. As a graduate of the prestigious Culinary Institute of America in Hyde Park, New York, he demonstrated the skills to dish up sumptuous dinners in the snug, ground-level dining room and bar evocative of an old schooner. A few of the participants at the 2015 New York State Sporting Clays Championship. After a day of shooting at the championship, vendors and contestants gathered there for cocktails and dinners of prime rib, salmon and other savory delectables accompanied by a fine bottle of wine. By some standards the food might be considered pricey, but well-presented and delicious nonetheless. 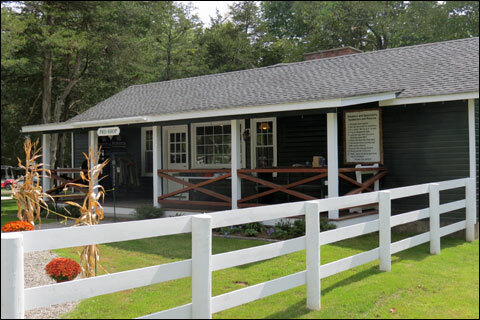 The Old Drover’s Inn is located in Hudson Valley Wine Country with some 50 wineries. Wine making in the region is documented to the French Hugenots’ in 1677 – slightly before the Old Drover’s Inn opened. The Muncey brothers stand to redefine clays shooting into a luxury pastime with all the amenities we come to expect from premium destinations such as brilliant food, local wine tasting and lavish accommodations. While there are three-star resorts in America that offer clays as another pastime, the Beretta Shooting Grounds at Dover Furnace would become the crown jewel of a world-class, clays-shooting resort.